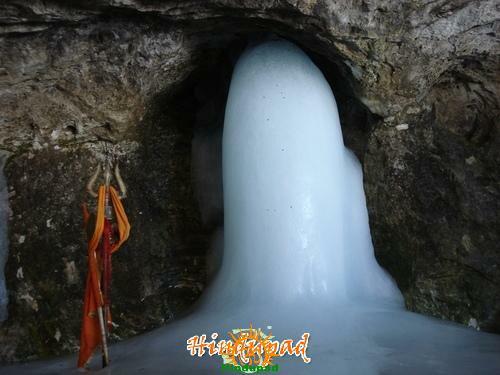 Amarnath temple in Kashmir is the cave temple of natural ice shivling. It is one of the most revered pilgrimage places in India. Amarnath cave temple is located at 86 miles north east of Srinagar at 13000 feet above sea level. Surrounded by the snow clad mountains, Amarnath enshrines a natural Shivaling of ice formed by the drops of water oozing in the cave. There is a block of ice representing Lord Ganesh to the left of the Shivalingam and other two ice blocks representing Parvati and Barirava lie to the right of the Shivalingam. Amarnath temple remains open in summer only for a couple months (June – July – August). Amarnath Yatra is one of the toughest but most revered yatra in Hinduism. Those who visit Amarnath temple will not have rebirth. Amarnath Yatra 2015 begins on July 2 and ends on August 29 (Shravan Purnima). A small cave inside Amarnath has a chalk like substance which is given to pilgrims as Vibhuti. The trek to Amarnath begins at Srinagar. The route covers Pampur, Avantipur, Brijbihara, Anantnag, Gautam Nag, Martand, Pahalgam, Chandanwadi, PishuGhati, Seshnag, Wavjan, Mahagunus Pass, Panchatarni and Amarnath.